"The Ark, turning into wind"
Image Size 32" x 16"
Overall size with wash/line french bound mount 28" x 42"
THE ARK, TURNING INTO WIND "Stand clear of propellers, let pipes and intakes". Lieutenant Commander Flying has just made this pipe over the flight deck communications system. The Flight Deck of an aircraft carrier at sea has been termed the most dangerous place on earth To an artist whose emotions are stirred by almost everything big, dramatic and exciting, such a place is almost beyond contemplation. Where ever I looked there was activity of a kind that would have produced a thousand paintings. Gannet aircraft were being towed with their wings folded looking like Praying Mantis, Buccaneers and Phantoms were coming up from the inner depths of the ship on lifts, taxying to the catapult for take off. The sight of a 20 ton Buccaneer with its twin Spey engines at full throttle generating as much power as a destroyer, rearing up like a prehistoric monster and straining for release from the catapult, and then accelerating from stand still to 130 miles an hour in a couple of seconds, was almost too much for me! The feeling it inspires beats the rush of adrenaline sports, tops the thrill of having the highest poker hands in a high-stakes game and makes the emotions of a night at the opera pale in comparison. I was privileged to spend a large part of my time aloft in the Ark's plane guard. This was a Fleet Air Arm Wessex Helicopter which always had to be flying nearby when the ship was launching or recovering aircraft, and I have included a small pencil sketch of my Wessex on the border of the print. Sitting with the door open looking down on the Ark sailing in a calm blue Mediterranean gave me the most wonderful opportunities to study her lines and enable me to sketch her at what I consider to be her most flattering angle. The comment from Rear Admiral Anson, her last Captain who appropriately was the first to see the painting, was that it was a happy picture of a happy ship I would like to thank Admiral Anson, incidentally, for allowing me to play with his ship. Considering that I have never worn a uniform in my life, it was a particular thrill to be able to sit in a helicopter above such a ship and then request the Captain to turn a few degrees to port, please, so that I can see a little more shadow on the hull; and then a few moments later see 50,000 tons of aircraft carrier manoeuvre just for me! I have painted the Ark turning into wind to launch her aircraft. In such a calm sea she would have to attain a maximum speed of 28 knots to launch her heavy jets It is critical for an aircraft carrier not to remain on a predictable course, when heading into wind launching aircraft do not wait for a second longer than is absolutely essential because then she is at her most vulnerable to submarine attack. The order has already been given, therefore for all aircraft to start engines before the great ship has actually begun to turn into wind. The Gannet in my painting will be the first away from the catapult. In 1973 my painting Tiger Fire raised £127,000 in six weeks for the World Wildlife Fund. Two years later African Afternoon raised a further £85,000 for the Fund. The formula was a simple one. A single limited edition of 850 signed copies was published of each painting and the Fund was the main beneficiary from the sale of the prints at £150 each. Raising such sums with apparent ease inevitably led to a very large number of charities asking me to do the same for them. I can only manage one such scheme a year and in any case scarcity value is one of the reasons why the formula is so successful. I owe a great deal of my success to the Services, It was a journey to Kenya in 1960 with the Royal Air Force ostensibly to paint aircraft pictures that led directly to my painting wildlife, and in particular elephants, for the first time. When I received an invitation from the Royal Air Force Benevolent Fund to raise money for them, in 1977, it was only appropriate therefore that I accepted with great pleasure. My painting Winter of 43, somewhere in England? which depicted a Lancaster bomber at dispersal being prepared for a raid over Germany was published in a limited edition of 850 signed copies and a net sum of £95,000 was very quickly raised for the Fund; "what proved to be the most profitable single money raising operation the Fund has ever undertaken". Quote from THE DEBT WE OWE by Edward Bishop. As a direct result of this success I was approached by the Fleet Air Arm Museum at Yeovilton to do a similar scheme for them, to help meet the enormrous cost of the Museums extension. At about this time HMS ARK ROYAL was coming to the end of her service career and one of my lifelong ambitions had always been to experience life in an operational aircraft carrier at sea. I saw this as my chance to achieve this ambition! As it had been essential to fly in a Lancaster bomber in order to paint it, it was also imperitive to get the feel of the Ark in order to paint her portrait, and so I flew out to Malta on the 15th of November, 1978, where I joined the ship for part of her final journey home. The four days that I spent aboard her were possibly the most exciting of my life. The Ark, turning into wind will be published in a single edition of 850 signed copies. One third of these must be put aside for normal trade outlets and the remainder will be sold direct from the Fleet Air Arm Museum, RNAS Yeovilton, Somerset. As with Winter of 43, somewhere in England an exclusive reception will be held for buyers of the print. One print number will be drawn and the winner can commission me to paint, free of charge, a canvas measuring up to thirty by twenty inches framed, of any wildlife subject. Six weeks after Tiger Fire was announced all the copies had been sold, and the prints of this painting are now worth a thousand pounds each. Before I had even started my Lancaster painting over 120 copies had been ordered. 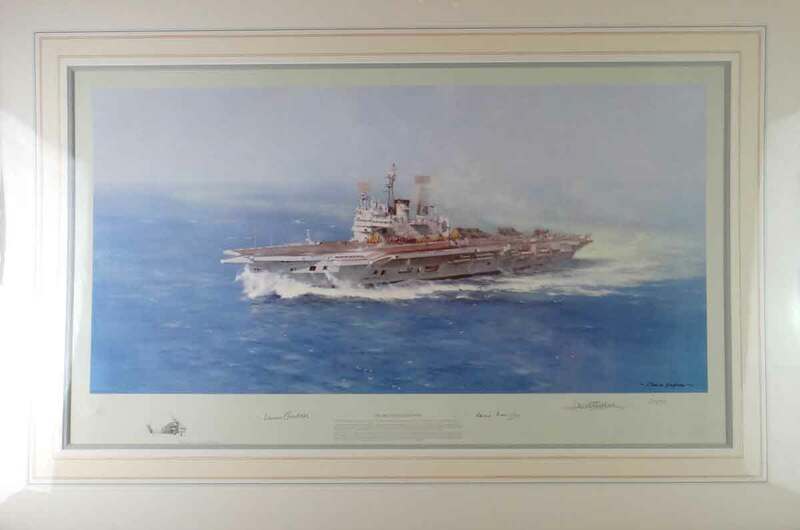 I am delighted to say that immediately it became known that I had been in HMS ARK ROYAL and that I was going to paint a picture of the ship for the benefit of the Fleet Air Arm Museum over 200 prints were reserved at the Museum long before the painting had even been contemplated in detail, let alone painted! "It gives me enormous satisfaction to know that I can raise such sums of money with such apparent ease for such worthy causes.Thank you as always." and the wonderful paintings of his model Cecilia often depicted in the french countryside, is simply incredible.